If you didn’t know its context, you’d swear this could be one of the many neglected corners of the city. The grass has been purposely killed, the “mushroom” table has been ripped out, an excessive amount of strange black posts are jutting out of the ground, and caution tape has been sloppily draped every-which-way. 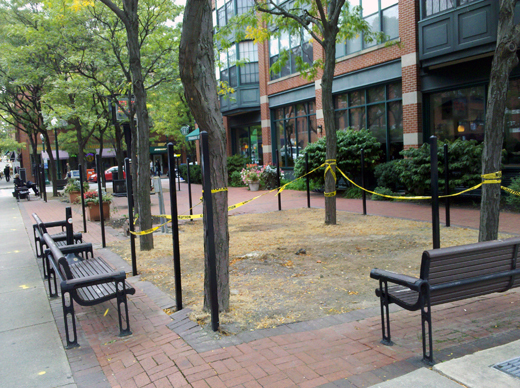 Yet, this is in fact the main public space in the heart of Armory Square, where countless shoppers, diners, families, tourists, workers, students and others pass by and linger in on a daily basis... and it has looked like this for weeks. I’m not sure what this piece of parkspace is [very slowly] transforming into – I hope those black posts don’t imply that it will soon be fenced off – but I certainly hope the transformation is complete soon. How could such an important central space be left this way for as long as it has been? What does this say to visitors from out of town – or visitors from close to home, for that matter? It comes back to the simple act of informing the passer-by of what’s going on. Shopping malls put out signage when they’re renovating, asking you to “forgive their appearance while they upgrade your shopping experience.” Why can’t a simple sign, along a similar vein, be put in this park to inform us that the ugly dead grass will soon become something magnificent?